Use it with default settings on EURUSD H1. Kilimanjaro is a fully automated expert Advisor with secure stop loss level. 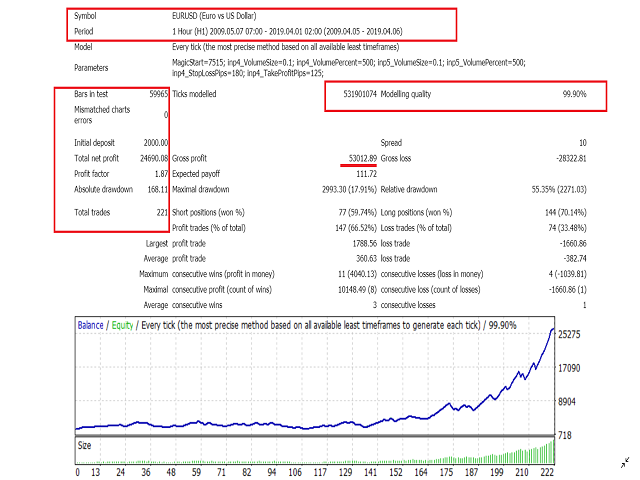 Kilimanjaro EA passed 10 year (2009-2019) real 99.9% tick data backtest with spread and commission! auto lot based on account equity! This EA’s Strategy is a result of a 6 years manual trading and continuously sharpening the system. Now i made an EA out of it and it passed 10 years real 99.9% tick data backtest. This EA is a beast and waiting for the prey patiently to hunt it down, and make profits. It trades the trend and enter the market based on candlestick patterns and 4 moving averages with fully optimized parameters to find the sweet spot to open trade, also trades the Big movements, and rides it when the market is the most the most volatile. If you have any questions contact me, i am glad to help you! If you are using backtest data with lower precision than 99.9%, then the results may vary ! !